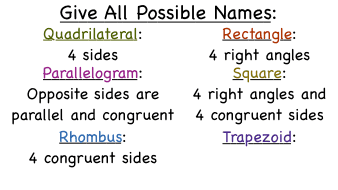 How Do You Classify Quadrilaterals? Got a figure with four sides? Then you have a quadrilateral! But there are many special types of quadrilateral. Follow along as this tutorial shows you how to figure out the possible names for a given quadrilateral! The term quadrilateral is a really fancy sounding name for a certain kind of polygon. Did you know that there are special types of quadrilaterals? Watch this tutorial to learn about quadrilaterals and their special types. How Do You Find Missing Angles in a Quadrilateral With Variables? Trying to figure out the measurements of the interior angles of a polygon? Then check out this tutorial! This tutorial shows you how to create an equation and solve it to find those missing measurements. Take a look! How Do You Find a Missing Angle in a Quadrilateral?